Delvera is ‘a new concept, entry level’ brand range to be introduced by Delheim winery in conjunction with Muse Wine Agency. I tasted both Delvera Pinotage 2017 and Delheim Pinotage 2016 at Intrepid London. Delvera has less wooding, is bright purple and is approachable, light bodied but with some grip on the finish. Delheim Pinotage 2016 is tighter than the Delvera with sweet fruit backed by wood with grip on the finish. I was told it spent 14 months in small and large French oak barrels. It has probably just been bottled, as according to Delheim’s website the 2015 was bottled in September 2016 and the 2014 in October 2015. There’s no sheet yet for the 2016 vintage. .
Delvera is merges Delheim and Vera, Vera being the wife of Delheim’s patriarch Spatz Sperling. Vera is also referred to in Delheim’s top single vintage Pinotage, Vera Cruz – Vera’s cross being Spatz! The 2015 Vera Cruz Pinotage needs more time as it is still tight and closed and I reckon this also has just been bottled. Delvera is also the name of Delheim’s nearby agri-village on the R44 with shops, arts & crafts and restaurants. The Delvera label pictured above is a mock-up prepared for the show and is not finalised. 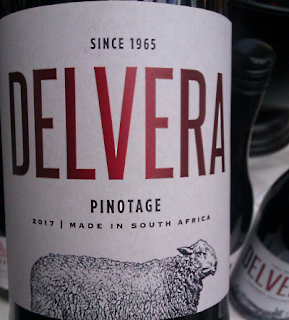 I don’t know the meaning of the sheep, but I do know Delheim’s Pinotages make a good partner for lamb recipes. To Kensington’s Olympia for Wines of South Africa’s annual Intrepid exhibition. Last year the weather was so hot ice melted faster than it could chill wines, this year was cool with heavy outbreaks of icy rain. 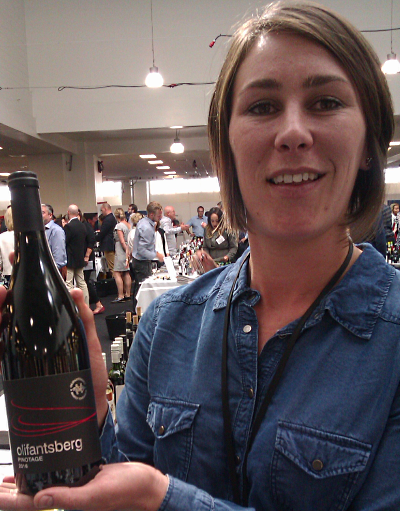 At Olifantsberg Family Vineyards stand I listened in to winemaker-viticulturist Elizma Visser (above) explaining their philosophy which is to “pick early, do wholeberry fermentation and try not to over-extract,” to an enthusiastic audience. Elizma is in her third year at Olifantsberg, previously she worked at Waverly Hills and Bilton. 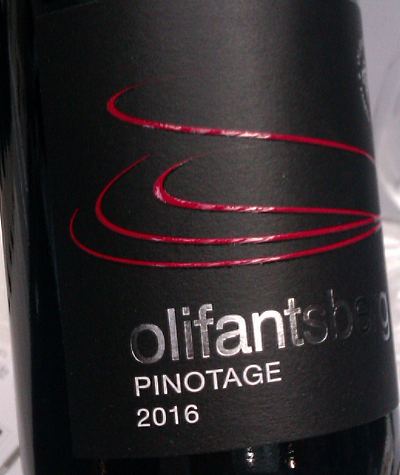 I can’t recall encountering Olifantsberg before so I was keen to try a wine new to me. 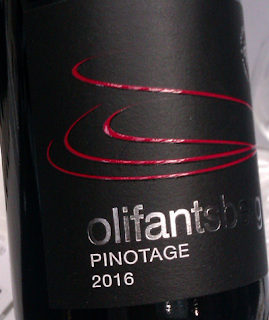 Their 2016 Pinotage from a 10 year old trellised mountain-side block was an approachable 13.5% abv, and tasted of fresh fruits with raspberries and cherries to the fore. There was no noticeable oak, but Elizma told me that, after natural fermentation, it spent 10 months in small and large barrels but fewer than 10% were new. 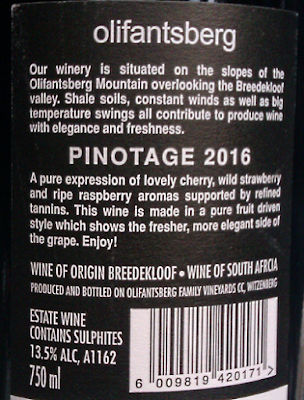 The wine is an attractive light bodied fruit-forward luncheon Pinotage. But I am a bit confused because although the wine is listed as 100% Pinotage on the Intrepid catalogue, the fact sheet for this wine on Olifantsberg website says it is blended with 14.8% Cabernet Sauvignon and has an abv of 12.9% while the fact sheet on their UK agents Hallgarten Druitt and Novum says abv is 14%. While the label is allowed a leeway on alcohol as they’re often printed before the wine is finalised, I’d expect to find matching information on the winery and importer websites. 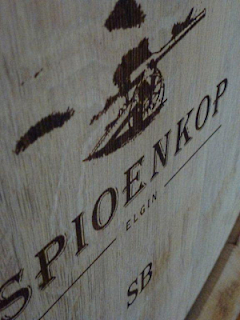 Malu Lambert visited Spioenkop to interview Koen Roose for winemag.co.za; read the full interview here and for more, see Koens own view of his new style Pinotage here.